NYFW. My beloved Zanita snapped these pictures of me just before the last rays of sun disappeared behind the skyscrapers and I love that magical pre-sunset light she captured so well in these shots! Fina Zanita plåtade de här bilderna på mig under NYFW precis innan solen försvann bakom skyskraporna och jag älskar det magiska ljuset i bilderna! LEATHER VEST Acne (old but similar one here). BLOUSE Burberry. LEATHER PANTS J Brand. 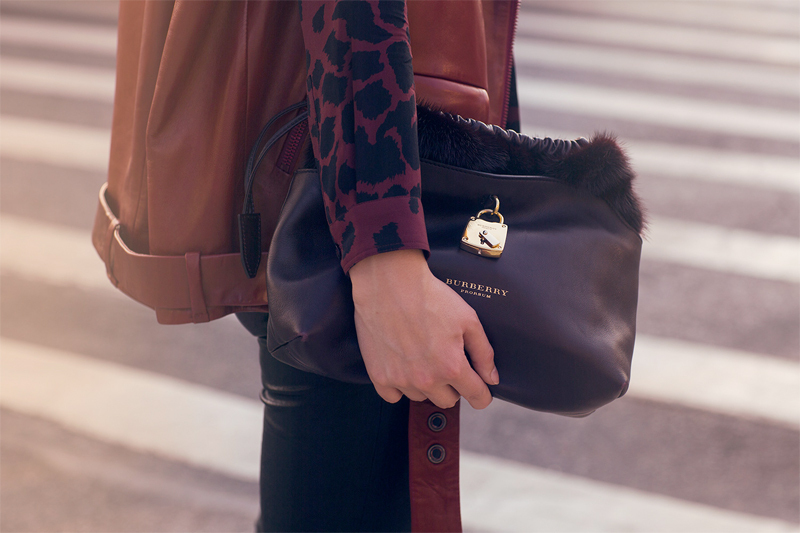 BAG Burberry Prorsum “the crush“. BOOTS Isabel Marant. This entry was posted in Outfit and tagged acne, Burberry, Burgundy, FALL by Carolina Engman. Bookmark the permalink. I love tha vest and the bag!!!!!!!!!!!!!! The photos are so beautiful and this outfit is gorgeous! I especially love your sleeveless jacket! 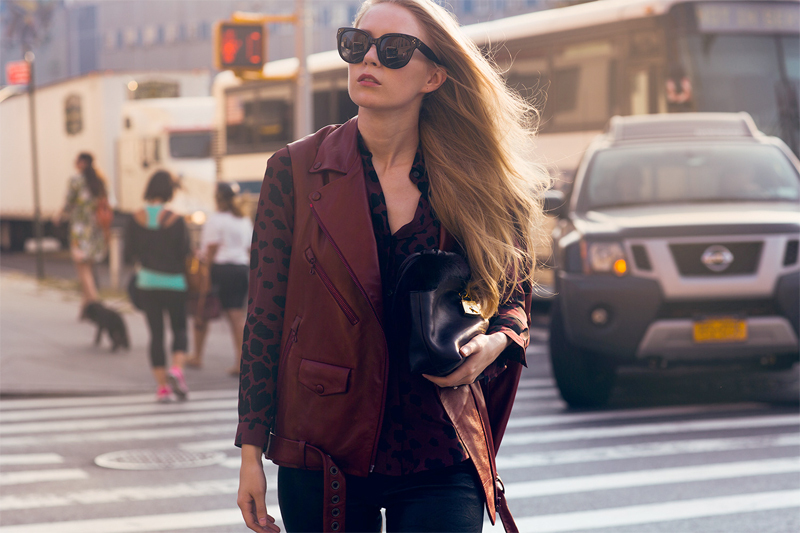 Beautiful shots and loving the red leather vest, perfect fall outfit! Stunning! I like this outfit! just in the mood for autumn! The lighting is A-M-A-Z-I-N-G! And what about those I. marant boots! Love love love! Closet sale with DIOR items on my blog! Love these shots too! The shirt is so cool. Love the whole outfit, vest looks amazing! WOW! Absolutely love the pictures and the outfit! SO jealous of the bag! fantastic pictures, you are lookin gorgeous! Absolutely amazing!! The vest and blouse are fabulous! Beautiful outfit. I like that bag. Great day. The bag is absolutely gorgeous, really love the blouse too! Great outfit!!! Love the jacket so much! Love the color of the leather vest! Zanita is the best! Love her blogger collaborations, she captures the light like no one else! Don’t miss you my Comfy-Chic Outfit with an amazing Maxi Skirt with open side!!!. The light in these photos is truly amazing. I adore the whole look, in particular the bag & boots. OMG need that leather vest! So cool! those pictures can’t get any more perfect, Zanita has a keen eye for lighting and I adore your outfit, perfect! Zanita is one of the best blogger/photographers! These photos are so beautiful! and Have been eying those Isabel Marant boots for a while now! Super cute! i love every one of these shots! they are so dreamy, as are you in all of the pics. ps. the outfit is on point! I’m in love with those sunglasses. Such a cool look! Your pictures always look incredible and I love your style, you are beautiful! Perfect fall colors. You look great! Looove this look! I want this jacket!!! Such a hip look. A bit of a rocker vibe. Wow, what a fabulous outfit. And your poses are so model-worthy. Great post. That’s a pretty awesome vest! Love the leopard print on that color! so unexpected. I actually though that was a jacket with patterned sleeve.. great layered outfit! I LOVE THAT JACKET. YES. that vest and burberry bag are amazing! Zanita totally captured you in a new light. Loved all the pictures ! You look amazing, the pics are jus so beautiful !! Oh GOD! I always love all the photos taken by Zanita! This ones are amazing and in NY, it can’t be better! You’re looking so fabulous Carolina! I really like your style and I’m totally in love with your blouse! Beautiful pictures, I love those sunglasses on you! I want that blouse! you look stunning. love the combination of the vest and blouse! greeat outfit… i love the color combinationa…Love! I fell in love with these pictures. You are beautiful and I love your style. I could just eat up that pouting mouth of yours! Loving that vest and bag! Now, this is what I call cool. The sunnies, bag and jacket are all stunnibg. Wooooow the light is perfect!!!! Beautiful images! That sunset glow is stunning!! LOVE the simplicity in the look! Love your vest and blouse :) !And the colour is very pretty .